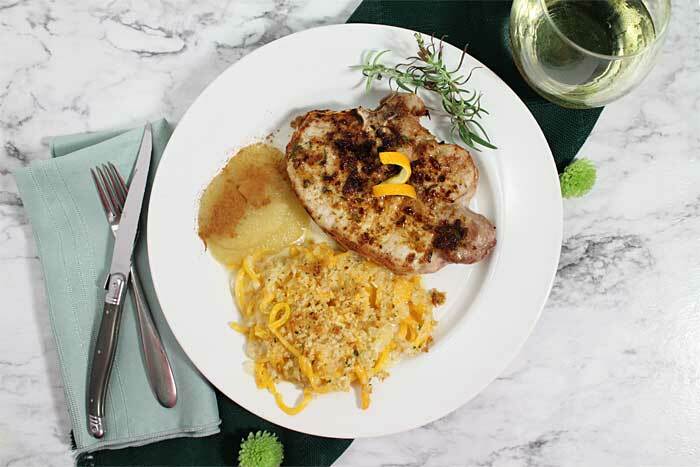 Dinner has never been easier than with these easy Air Fryer Pork Chops. 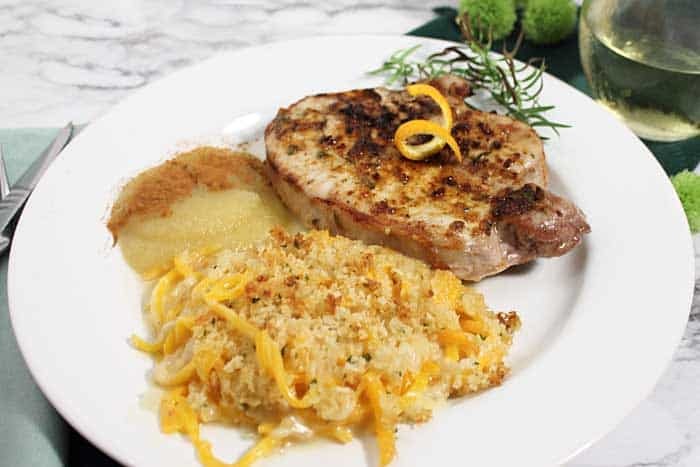 A little seasoning and 10 minutes cook time is all it takes to get these healthy, moist and delicious pork chops on the table. Your family will love them! If you’ve been following me, you know that my new love is cooking everything from appetizers to main meals to desserts in my Air Fryer. It’s one of the most convenient appliances I’ve ever owned! It’s not only easy to use but easy to cleanup too. 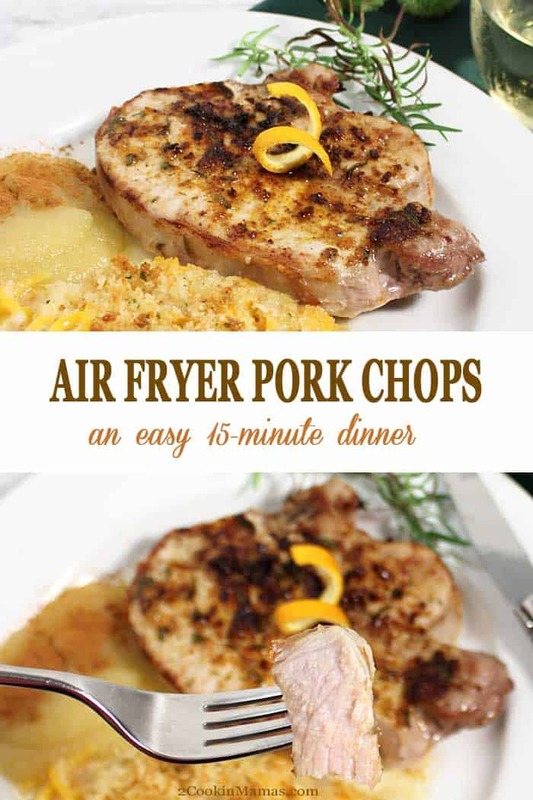 And these Air Fryer Pork Chops are no exception. I made a perfectly seasoned entree for dinner in just 15 minutes! 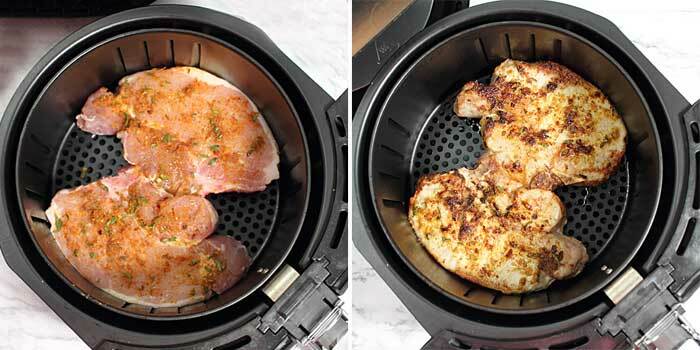 And the air fryer keeps the pork chops moist and browns them perfectly all at the same time. Gather the ingredients and mix the spices together for the rub. 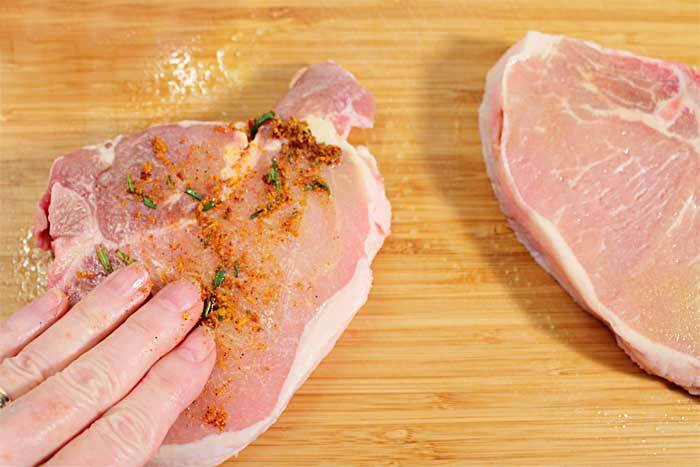 Rub a little olive oil on all sides of the pork chops. You can also spray them with a nonstick spray such as Pam. Then rub the seasoning mixture into the chops. That’s it. Ready for the air fryer. Spray the basket of the air fryer and place the chops inside. I thought these pork chops might have been a little large for my air fryer but it worked out beautifully. Next time though I plan on getting the boneless chops. 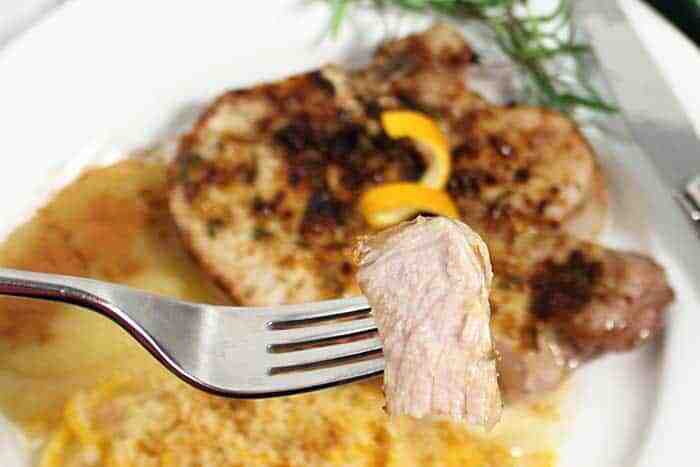 Set air fryer to 390 degrees for 10 minutes and out come some moist and beautifully browned pork chops. I served mine with my low carb Butternut Squash Mac and Cheese and some applesauce. I think they’d also be delish with Spanish Quinoa, a version of Spanish Rice and Maple Roasted Brussels Sprouts. 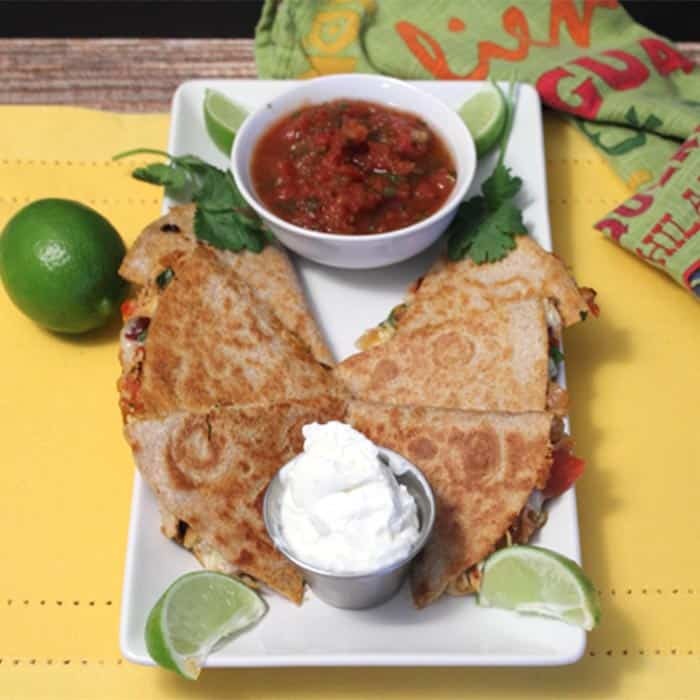 A delicious dinner that’s healthy, filling and will undoubtedly become your new family favorite. 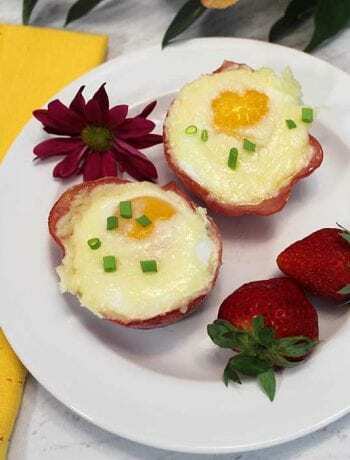 More air fryer recipes to love! The big game is this weekend so get ready with these Super Crispy Air Fryer Chicken Wings. These deliciously healthy air-fried wings have no breading and come out moist and flavorful. And don’t stop there! These Air Fryer Southwest Egg Rolls are the perfect game day appetizer. Egg roll wrappers are filled with spicy chicken, black beans, corn, minced jalapeno and plenty of cheese then cooked until hot and crispy. Less than 10 minutes in the air fryer delivers a delicious, healthier snack for your Super Bowl party. 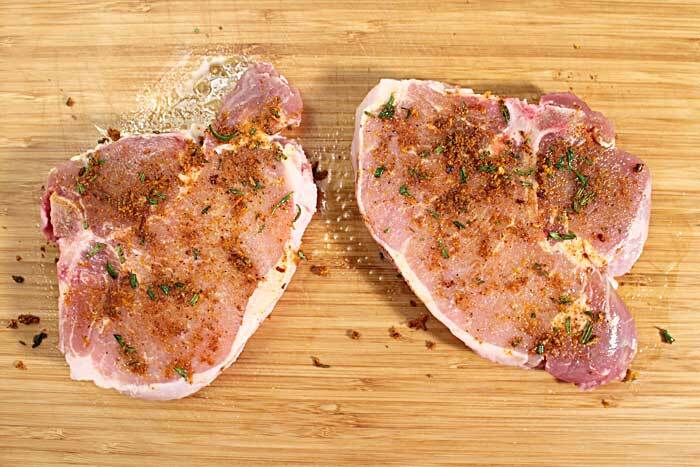 Rub olive oil over both sides of pork chops. 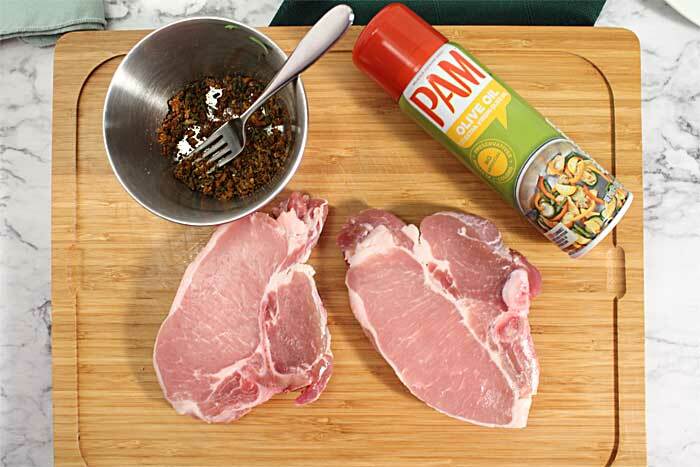 Combine remaining ingredients for seasoning and rub into both sides of pork chops. Spray basket of air fryer with nonstick spray. Lay pork chops in basket in a single layer. Try to leave some room around each pork chop for air circulation. Cook at 390 degrees for 10-12 minutes. 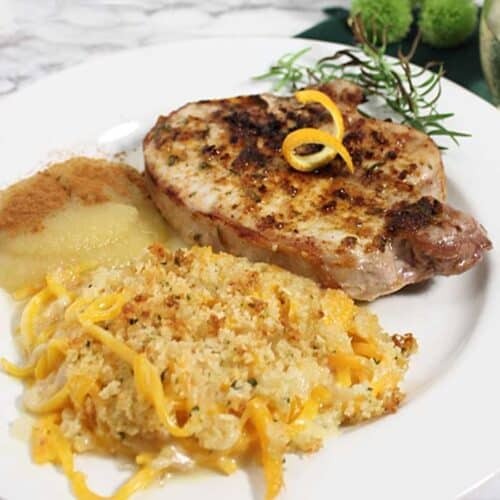 It is best to allow pork chops to come to room temperature prior to cooking. This takes about 30 minutes. What a great quick and easy dinner! I’ll definitely be making these again! It’s become one of our family favorites! I never would have believed I could cook pork chops in such a short amount of time and have them be so tender and juicy. 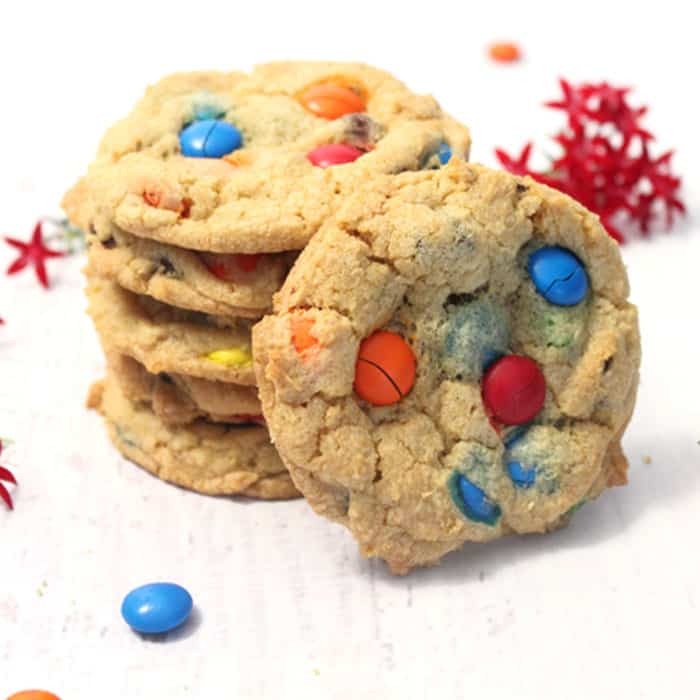 Love this recipe – thank you! Glad you enjoyed it! Now I don’t know what I’d do without my air fryer! I am officially obsessed with my air fryer, these were great!